As virtualization has already conquered the IT environment, a lot of traditional solutions are on the verge of literal death. Tape storage would seem a perfect target to be “destroyed” by virtualization, but the truth is – tape will never die. With better TCO compared to any disk technology and active regulatory requirements, tape technology is only upgrading all the time. 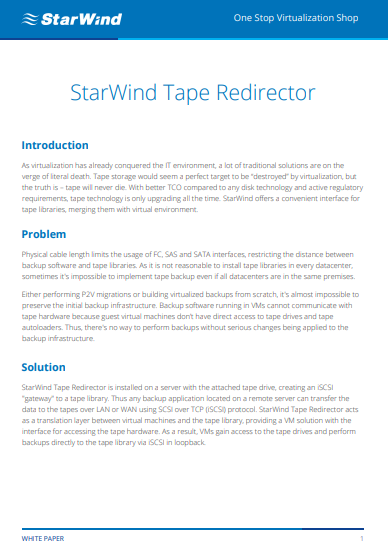 StarWind offers a convenient interface for tape libraries, merging them with virtual environment. 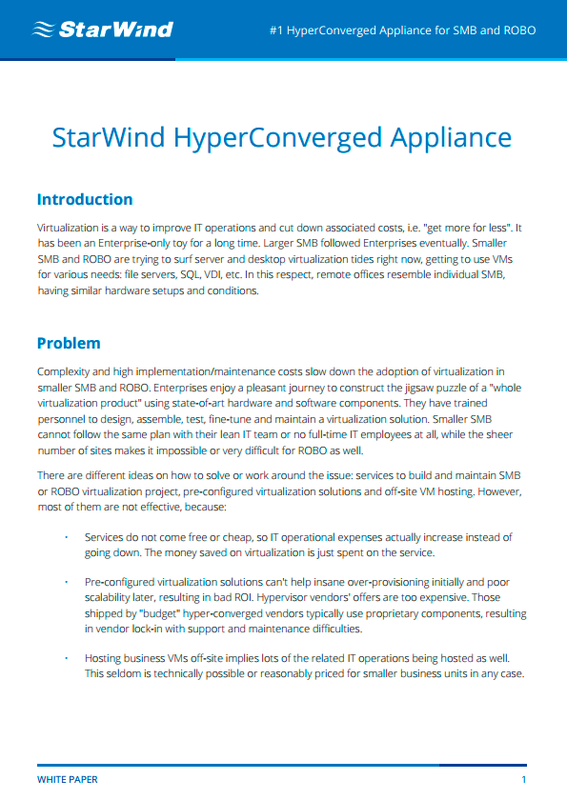 This document describes StarWind HyperConverged Appliance as solution for ROBO, mid-sized and smaller SMB that allows to bring in quick deployment and operational simplicity to virtualization workloads and reduce related expenses. A reliable connection metrics tool is a must-have for any IT manager’s toolkit. 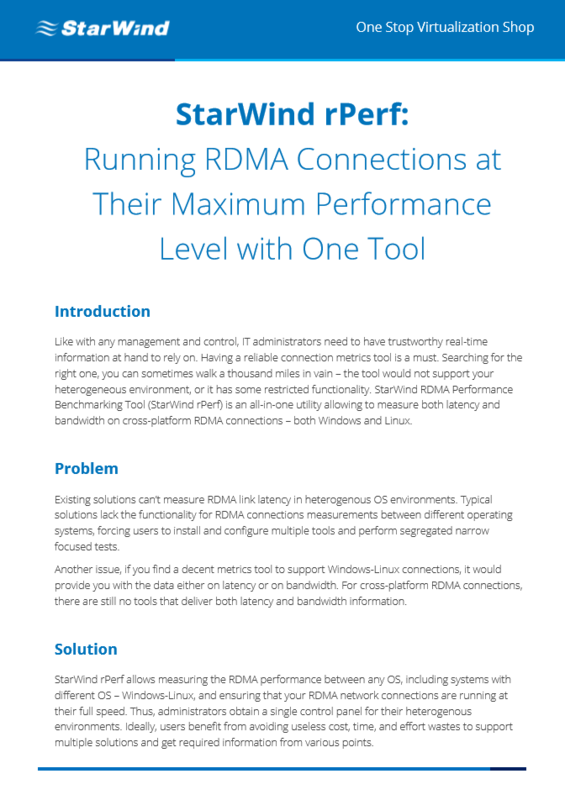 StarWind RDMA Performance Benchmarking Tool (StarWind rPerf) is an all-in-one utility allowing to measure both latency and bandwidth on cross-platform RDMA connections – both Windows and Linux. When it comes to starting a business these days, there’s almost no chance to avoid any IT technologies alongside with it. Generally, each company, will it be a bakery, a law agency or a charity organization etc., is in touch with computers. Starting from simple desktops and applications, IT-related stuff goes all the way up to massive datacenters and complicated computing systems. 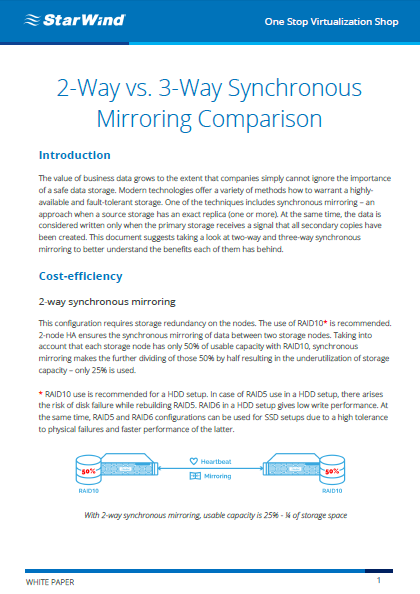 This document suggests taking a look at two-way and three-way synchronous mirroring to better understand the benefits each of them has behind. In their usual routine, IT administrators face a considerable variety of different tasks. 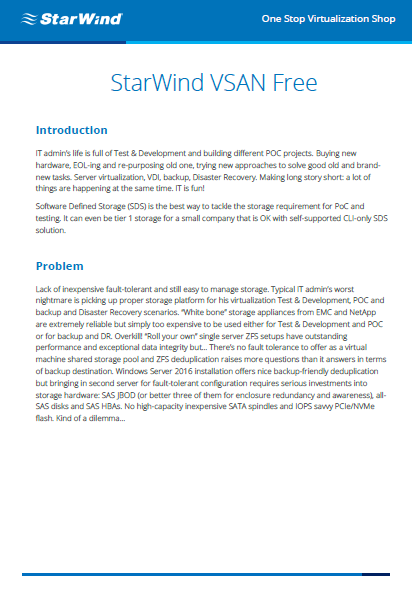 Finding a proper storage platform remains the most challenging one. Picking up the right solution for Test & Development, POC and backup and Disaster Recovery scenarios can become a nightmare sometimes. 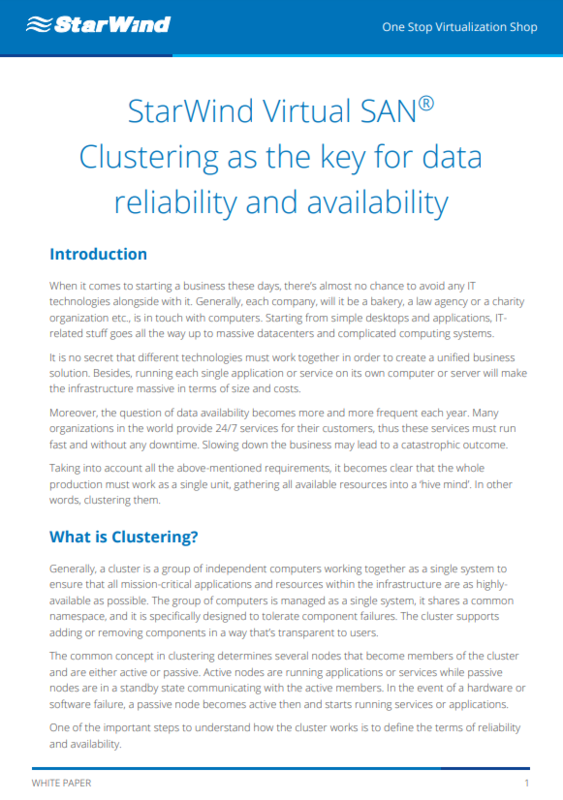 StarWind Virtual SAN Free is a fault-tolerant and still easy to manage software-defined storage that perfectly suits the shared storage purpose. It is managed via CLI but includes UI for monitoring.